A FEW YEARS AGO, WE WENT OUT PARTYING IN A CLUB CLOSE TO KLÄPPEN. WAS ABOUT THE FIRST TIME ANTON LINDEN AND MYSELF MET. GETTING DRUNK IN SWEDEN IS F*CKING EXPENSIVE, SO ANTON PULLED UP WITH A HIP FLASK AT THE CLUB. ACTUALLY A LIFE SAFER! ON THE HIP FLASK WAS A 'RONNY' ENGRAVING. THE ORIGIN OF RONNY IS STILL UNSETTLED DOE. WHILE TAKING RONNY SHOTS TOO CLOSE TO THE BAR, THE BARKEEPER WASN'T AMUSED ABOUT IT AND RONNY WAS GONE FOREVER. 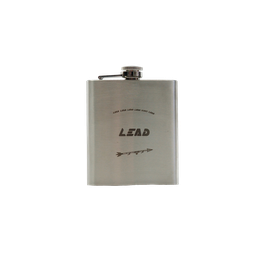 AT THAT MOMENT LEAD HASN'T EVEN EXISTED, BUT WHEN THERE WAS THE IDEA ABOUT PRODUCING A HIP FLASK, IT WASN'T EVEN A QUESTION THAT THIS PRODUCT WILL BE DEDICATED TO RONNY.